Ole Miss Mom: Can We Keep It Mom???? Oh boy. I think "those days" are approaching fast. And by "those days", I mean the time of life where your kids want to keep every animal they find. Sure, they've been interested in little critters they find outside and like to put them in their "critter cages". 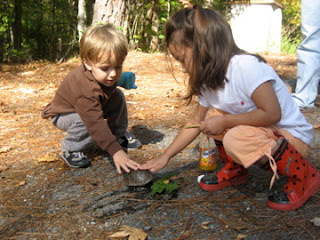 But this past weekend at the lake they found......dun dun dun.........a TURTLE. Now that's a step up from a salamander. They found it on their "nature walk" with my Mom. 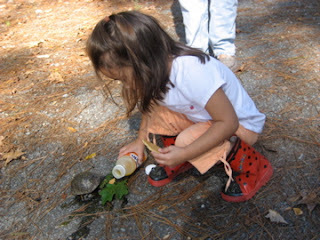 Olivia wanted to feed it some graham crackers and juice. 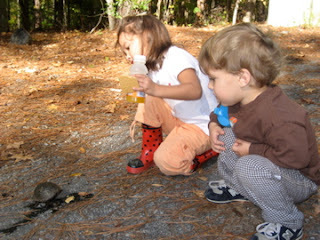 Then Lovey tells them that turtles drink water, better yet, she decides to take it up to the house and get it some water!!! :-) Thanks mom - they would have never thought of that on their own! :-) Ok, so what's a little water in a box gonna do?? We let her bring it up and she "played" with it for a while. Here she is feeding it her cracker and orange juice!! Yummy! We took it up to the house and put it in a box for her. Little did we know that during her nap, my brother-in-law took it down by the lake to "let it go" for us. He had heard me say that it wasn't coming home with us! :-) Poor Olivia, she woke up from nap, went straight outside to the box, only to realize that her turtle was GONE! She cried a little, but we explained that it would be much happier out where God intended it!